Exhibiting high strength, low friction, and good wear properties in wet and dry environments, acetal one of the most versatile engineering plastics available. Acetal plastic is relatively easy to machine, making it ideal for applications that require complex and/or tight tolerance parts. Upland Fab’s extensive experience in working with acetal and diverse CNC machining capabilities enable us to produce high precision parts from acetal plastics in various grades. Acetal plastic is available as a homopolymer and as a copolymer, both of which provide specific characteristics that may make them better suited to your application. Acetal homopolymer and acetal copolymer are available in a variety of grades, including FDA compliant grades for food-contact applications. Contact us to discuss the material requirements of your project. Acetal homopolymer is better known as Delrin. Delrin provides greater strength at room temperature than acetal copolymer, as well as greater stiffness and toughness. Acetal copolymer provides superior performance in continuous high heat or hot water conditions; it also exhibits lower porosity than acetal homopolymer. Upland Fab utilizes multi-axis CNC machining when working with acetal plastics. 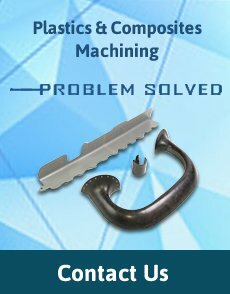 Our state-of-the-art fabrication technology ensures that your parts are machined correctly the first time, with minimal handling, fixturing, and material waste. Thanks to our advanced CNC capabilities, even the most complex parts can often be completed in a single operation, leading to faster turnaround times. Using DPD/MBD processes (Digital Product Definition/Model-Based Definition), we are able to machine parts directly from your CAD models. This significantly reduces the possibility of error, improves accuracy, and lowers costs. Upland Fab makes customer communication a top priority. We provide consistent, reliable communication throughout every step of your project. You’ll have a single point of contact from start to finish, providing you with regular updates and, more importantly, the peace of mind that comes from knowing that your project is progressing on schedule. Upland Fab is your #1 source for precision machined acetal plastic parts and components. Request a quote to get started, or contact us to discuss your next project. Upland Fab has been providing top-flight plastic and composite machining in Southern California since 1970. Contact us or request a quote to get started on your project.